I’m not a doughnut person. Glazed, sticky, sweet doughnuts don’t do anything for me. Neither do filled doughnuts, like lemon cream, custard, or raspberry. 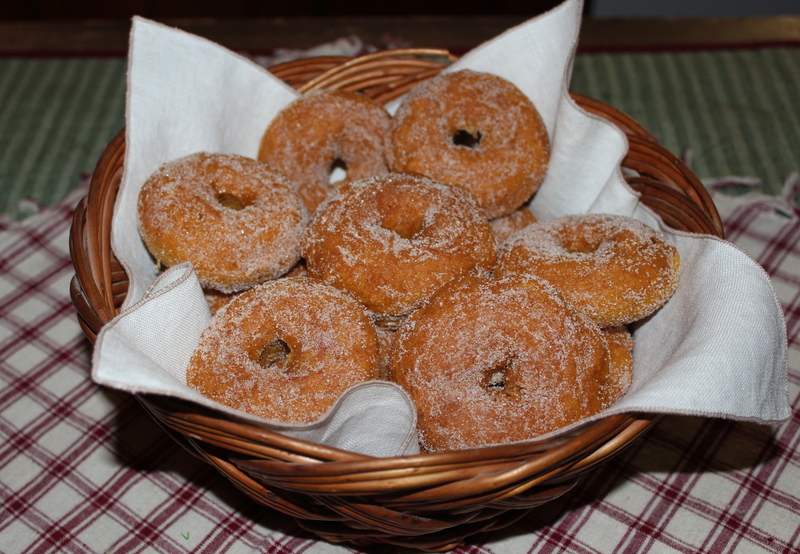 Ok, if you twisted my arm I would eat one, and most probably like it, but I don’t go out of my way for doughnuts. Am I being clear here? That’s why it’s so surprising that I was all over this recipe when I first came upon it. I think because they contain pumpkin. Pumpkin anything will get me every time. Pumpkin is one of those winter squashes I have been writing about. They’re everywhere at this time of year. But when cooking or baking with pumpkin you don’t want to use the Jack-O-Lantern type, but instead use the small sweet ones called Sugar Babies (or similar name). The flesh of these cuties is bright orange, sweet, and smooth, and while the canned version is very convenient, it is not difficult to cook the real deal yourself. So if you’re making your own pumpkin puree, cut the pumpkin in half, remove seeds, then bake or steam it, scoop out the flesh, and puree it using a processor, blender, or hand blender. This can be packed in measured portions and frozen, ready for however you will use it. 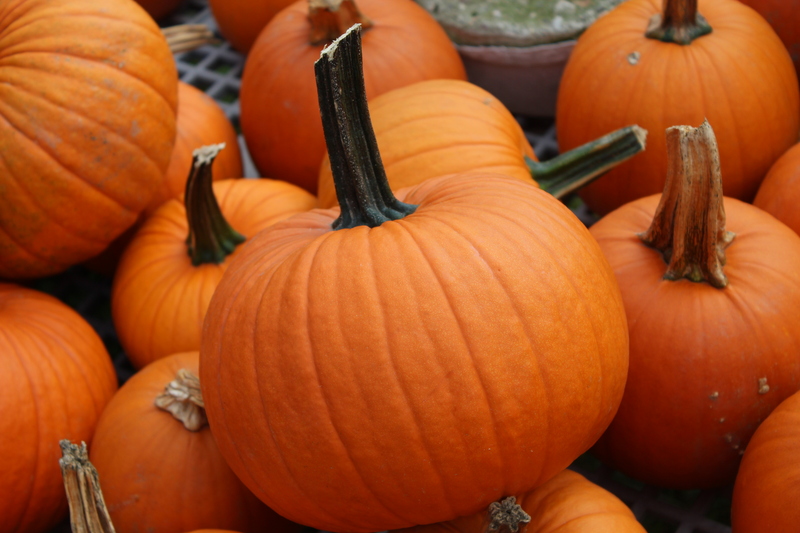 When choosing a pumpkin, make sure it’s firm and without soft spots. Under cool conditions pumpkins keep for months without rotting–they love a 50-60 degree porch. In fact some get sweeter over time, so you need not feel pressured to cook and bake on the same day you buy the pumpkin. And remember the health benefits of this squash: it’s packed with fiber and is a great source of vitamin A.
Hopefully I’ve encouraged you to try using fresh pumpkin–it’s not hard to do–but if not, the canned version is certainly acceptable. 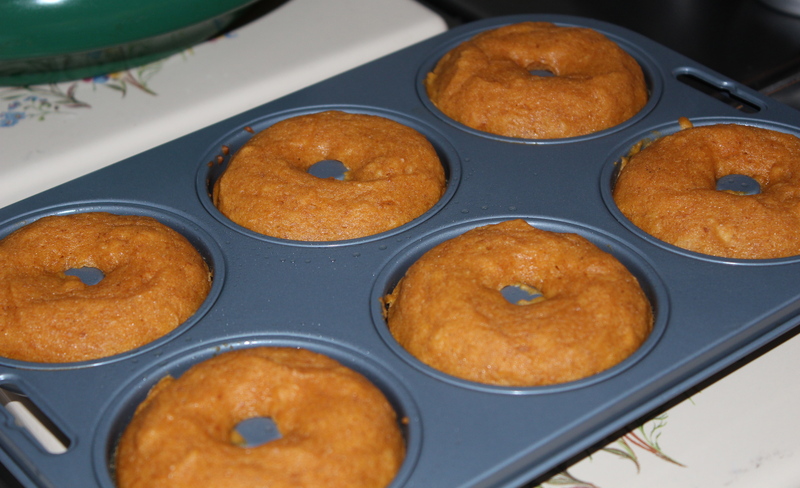 The recipe that follows is for pumpkin cake doughnuts. 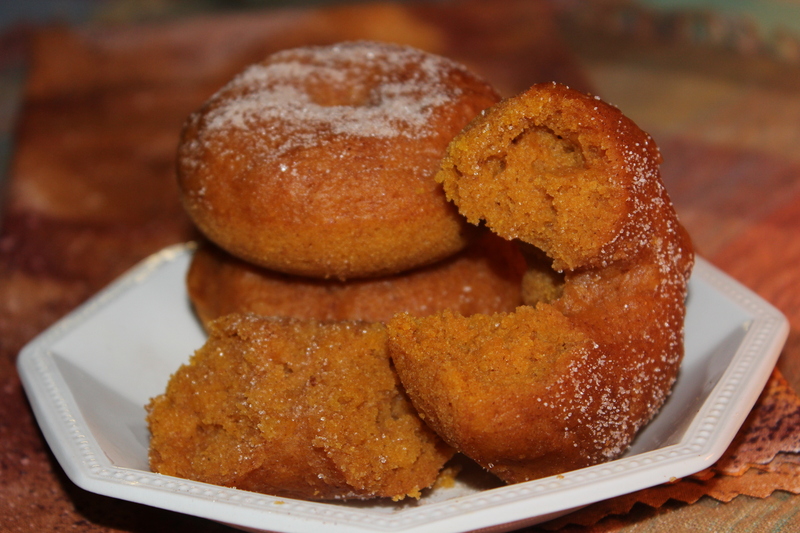 With their bright orange color, moist texture, and pumpkin flavor, these baked, not fried, doughnuts are the perfect thing to have with a cup of coffee or a glass of apple cider. The amount of dough this recipe makes is generous, and I was somewhat limited in pan choice since I only have one doughnut pan which holds six doughnuts. So I improvised and used a mini bundt pan, only filling each well a third way full. Still having more dough to use, I poured the rest into a six-cup muffin pan, and sprinkled the tops of them with cinnamon chips. In total, I got 18 doughnut-bundt-muffins. No matter what shape they’re in, they taste fantastic. Perfect for Fall! 1. Preheat oven to 350 degrees. Lightly grease 2 standard doughnut pans. 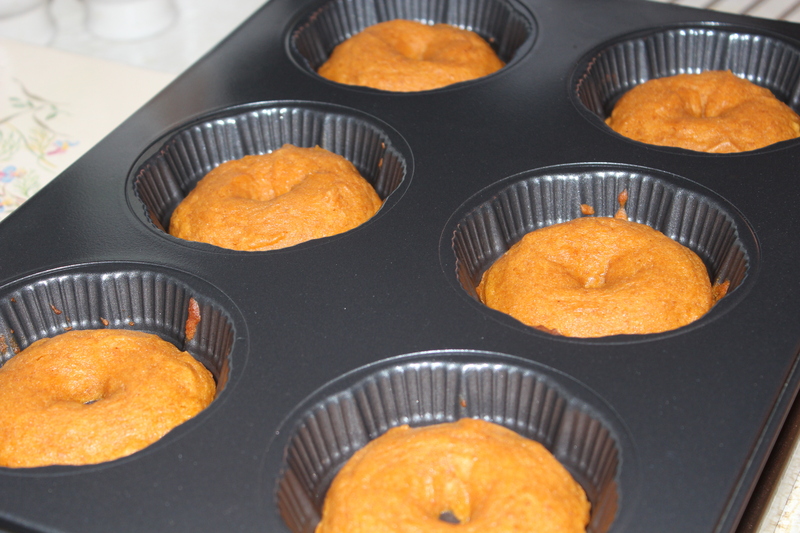 If you don’t have doughnut pans you can bake these in muffin tins, or other similar pans. They just won’t look like doughnuts. 2. Beat together the oil, eggs, sugar, pumpkin, spices, salt and baking powder until smooth. Hint: mix spices and baking powder with the sugar using a whisk for good distribution. 3. Add the flour, stirring just until smooth. 5. 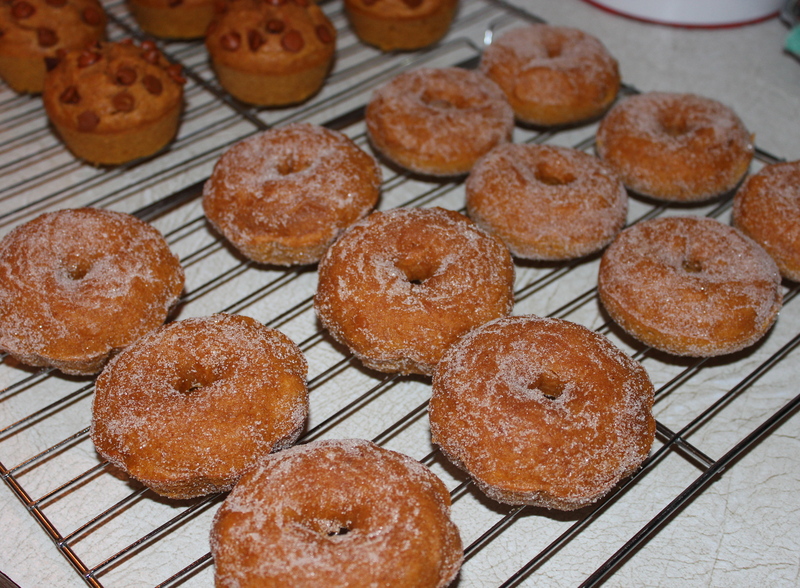 Bake the doughnuts for 15 – 18 minutes, or until a cake tester inserted into the center of one comes out clean. 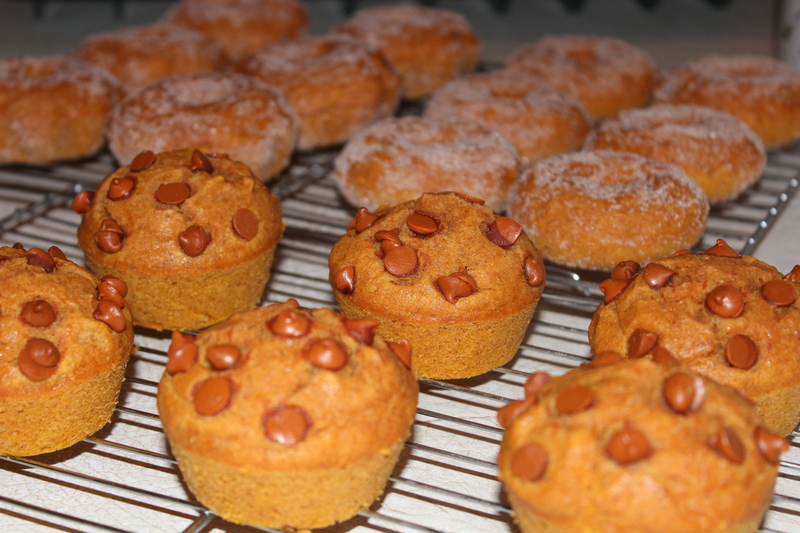 Muffins will need to bake for 23 – 25 minutes. 6. Upon removing from the oven let the doughnuts cool in their pans about 5 minutes, then loosen their edges and transfer them to a rack to cool.